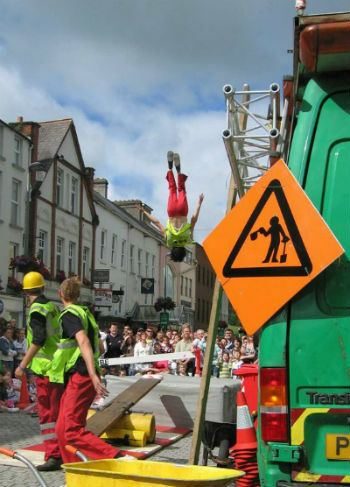 Road workers deviate from the norm by dancing, flying through the air, launching road cones into the sky and summoning a civil engineering superhero in a high flying acrobatic jaw dropping farce. Described as the “best show on the circuit,” highly original jugglers! The Small Job is an adaptable show and space size can vary depending on space available. The show has a walkabout element to it (approx 15-20mins) and a static show that last approx 15-20mins. For the static show space could take 3x4m or more. This show is self-contained and all the props fit inside one wheelbarrow. Hazard tape, measurement tape and few other small props. As well as creating silly installations and remote controlled creations, a significant area of the companies work is producing shows to engage with large scale urban regeneration projects and the construction works that create and maintain them. They hold the belief that works and construction (of all kinds) are a necessary and under valued part of urban life. 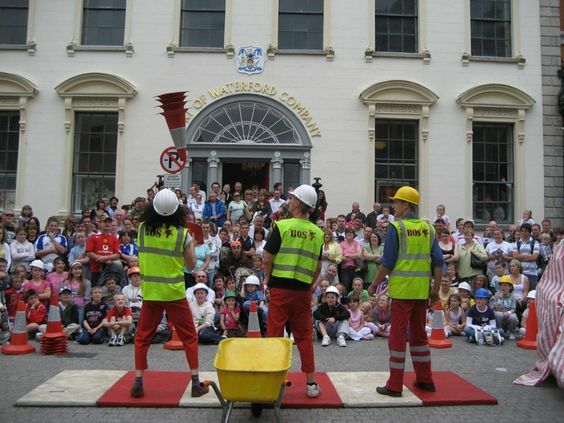 With their shows, they prefer to work alongside ‘real’ works and the companies responsible for them to generate smiles rather than groans from passers-by and the general public! Working to make sure that the soul of the community and site is kept alive during its regeneration, through creating fun, family shows and celebratory events that ensure a positive empathy with the construction process and the final results. Working with councils, town planners, town centre managers and development agencies creates long term strategies to help appease the disruption that urban works can cause and provides a unique way of spending 106 funds. To date, these performers have worked with various groups including Brighton and Hove City Council, Thornfield Properties, Takeuchi, UPLS, several London borough councils, and many more. The Workmen are members of the British Urban Regeneration Association (BURA) and the Association of Town Centre Managers (ATCM). 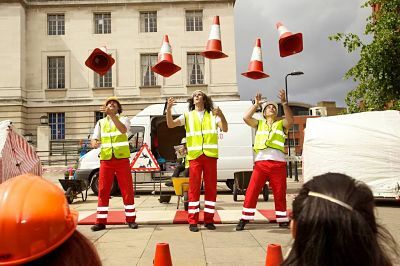 Road workers deviate from the norm by dancing, flying through the air, launching road cones into the sky and summoning a civil engineering superhero in a high flying acrobatic jaw dropping farce. Described as the “best show on the circuit”. This show can be performed as a walkabout act – with 30 minutes of mixing and 15 minutes of show. Alternatively, if just booking the show, set times are 2 x 45 minutes. Please see technical specifications at the bottom of the page. Spectacular, beautiful and funny, the “Charlie’s Angels” of municipal work are called to change a light bulb! It uses triples trapeze, web rope, acrobatics, clowning and plant machinery before ending in a firework display to answer the age old question of how many circus performers it takes to change alight bulb (6). Triples trapeze static srtiptease! 3 female workers are stuck up high in a cage, terrified. Through slapstick falling about, they discover the joys of circus and become glamorous trapeze artists. Ideal for cabaret, corporate events and festivals. This show lasts 15 minutes. Light entertainment aerial show involving triples trapeze, spinning web, rock and roll dancing, Doris the Transit van (stage), and The Monster(the telescopic Forklift). This show is 30 minutes long with 3 performers. This show includes more narrative. The new town centre light inauguration ceremony goes wrong when the local dignitary Fawcett Brown blows up the light bulb. How many aerialists does it take to change a light bulb? Big specky show involving 7 performers, all the above, plus bouncing boys on teeterboard, the lamp-post (Chinese pole) and loads of fireworks (depending on budget). It is an ideal finale show for small festivals, and lasts 45 minutes. I’m more than happy to offer my testimonial to the work that The Workmen did on behalf of Lambeth, which was supported by TfL in Brixton during our works. Initially, I had doubts, and concerns about how they could engage the community without causing reputational damage to our crew and also I had reservations regarding health and safety, especially when asked if they could enter our actual worksite. All of my concerns were put to rest and I can honestly say that they were a delight to work with. 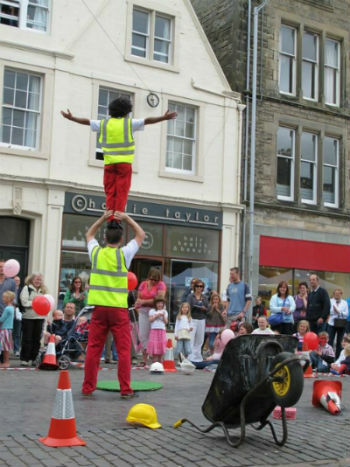 Their understanding and respect for health and safety regulations on a worksite, whilst being able to entertain the community is second to none. Their ability to turn what is a frustrating and tiresome situation into something fun, exciting and amusing is remarkable. The Workmen transformed the road works on Brixton High Street into delightful, comic street theatre scenes which captured the imagination of passers by. 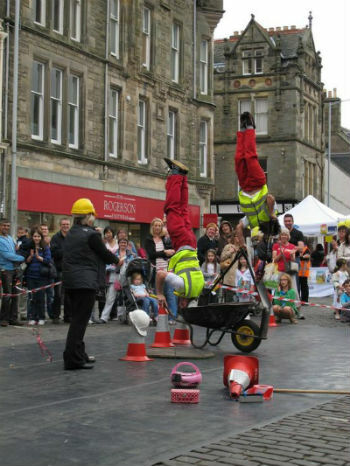 They offered the public a new way of viewing what is normally an irritating disturbance to their day, using the road works to create humour and fun. As one woman commented ‘It’s wonderful to see some humour in Brixton!’. The lighting installations in the road works at night were especially successful, with large crowds gathering around to watch in disbelief as the ordinary, boring construction site came to life with lights and a water feature. Positive feedback all round, so again pass on my thanks to the guys.